COLUMBIA, S.C.  For the first time in its 96-year history, a female general is taking charge at the famed Marine Corps training depot at South Carolina's Parris Island. Brig. Gen. Loretta Reynolds, who is also known as the first female Marine to ever hold a command position in a battle zone, takes charge Friday at the installation south of Beaufort. Parris Island graduates about 20,000 Marines annually and is the only site where female enlisted Marines are trained to enter the service. Reynolds is a native of Baltimore and a 1986 graduate of the Naval Academy. She has worn the Marine Corps uniform for 25 years. She is taking over from Brig. Gen. Frederick Padilla, who is taking charge of the 3rd Marine Division in Okinawa, Japan. In her new position, Reynolds also will be in charge of the Marines' Eastern Recruiting Region, which covers the 23 states east of the Mississippi River. As a one-star general, Reynolds becomes only the third female general officer in the more than 200,000-member Marine Corps. 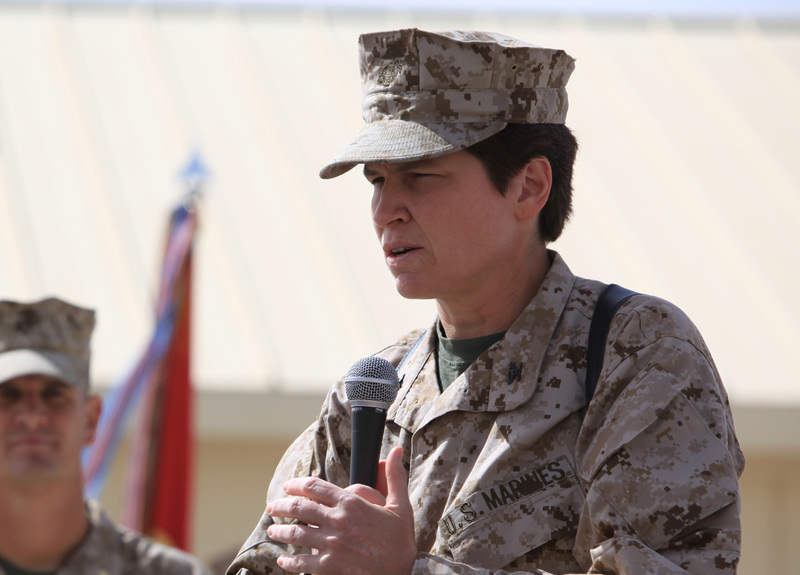 The service has two two-star female generals, one in the active duty ranks and another in the Marine Corps Reserve. Overall, there are 12,339 enlisted females in the Marines, 108 warrant officers and 1,224 officers, according to Marine Corps figures. On its Parris Island website, the service said training for men and women is identical, and that roughly 2,400 female recruits go through it every year. Reynolds trained as a communications officer and commanded Marines from platoon to battalion levels in her more than 20 years in uniform. She has been posted in Okinawa, Japan; Quantico, Va., Iraq and Afghanistan, and was in command of the Marine Recruiting Station in Harrisburg, Pa.
She also worked with at the headquarters of the Marine Corps in its communications and computer division in Washington, D.C.
Reynolds' last posting was in charge of the Headquarters Group for the 1st Marine Expeditionary Force based at Camp Pendleton, Calif. While serving a yearlong tour of duty in Afghanistan, she oversaw five Marine battalions and military company from Bahrain. While there, she took a base that had "fed, housed and equipped more than 10,000 Marines and expanded the base to handle an additional 10,000 Marines and sailors," the website for the 1st Marine Expeditionary Force said. The site added that the command slot position meant she was "recognized as the first female Marine to command battle space." Before her time at Camp Pendleton, Reynolds was a division chief with the Joint Staff at the Pentagon. Reynolds also has attended the Marine Corps University in Quantico, Va., the Naval War College in Newport, R.I., and the Army War College in Carlisle, Pa.